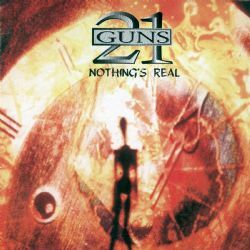 21 Guns – Nothing’s Real (Remastered Edition) including new sleeve notes by Metal Hammer’s Malcolm Dome, new interview with Scott Gorham, re-mastered version and six bonus tracks. Led by ex-Thin Lizzy guitarist Scott Gorham, 21 Guns consisted of Leif Johansen (bass), Michael Sturgis (drums), and Tommy LaVerdi (vocals). 1992 saw the release of 21 Guns’ debut recording for RCA Records, Salute, to critical acclaim, but after touring the record Gorham put the group on hold for several years as he performed in several tribute shows worldwide for late Lizzy frontman Phil Lynott. In 1997, Gorham resuscitated the band and the group issued second album, Nothing’s Real, which included a cover of the underrated Lizzy nugget, “King’s Vengeance” (a tune which originally appeared on the 1975 release Fighting, and co-written by Gorham).